This week we watched a short clip of The Wizard of Oz in AVID. I asked the students to consider who might play the parts of the characters in the movie in their life. It was a nice writing assignment and some students did an excellent job of coming up with comparison, simile, and metaphor. Wikipedia says this: "When the album is played simultaneously with the 1939 film The Wizard of Oz, numerous images from the film appear to synchronize with the music and lyrics. All band members (save Roger Waters) and engineer Alan Parsons have firmly stated that the phenomenon is a coincidence. 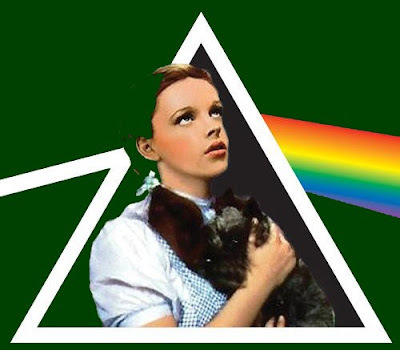 This effect has often been called Dark Side of the Rainbow. Arguably, playing any two media together will produce an impression of a striking amount of coincidence (an effect known as apophenia)." Rolling Stone did a quick Video Mashup of the coincidences: Dark Side of Oz! Pretty neat. Here are some interesting parallels that we've noticed over the years. As I said, I've tried to keep this list to the more striking moments. An internet search will turn up dozens more. -First and foremost - take a look at the cover of the album. It's white light exploding into color, just as the films moves from black and white into color. -In Breathe, the lyrics say "balanced on the biggest wave," as Dorothy balances carefully on a piece of wood. -The piercing bells of Time begin just as the Wicked Witch of the West appears on her bicycle (it's pretty chilling if synced correctly). -The lyrics say "home, home again, I like to be here when I can," as Dorothy contemplates heading back to the farm. -Great Gig in the Sky begins as Dorothy's house goes up into the tornado. The wails of Clare Torry, the female vocalist, crescendo and decrescendo as Dorothy sails up into the sky, and then back down again. Again, it's pretty chilling. Also, Great Gig in the Sky is an interesting title for a song with no lyrics - They could have called it anything. Why something so reminiscent of Dorothy's situation? -Then, in what is probably the most amazing feature of the sync, if your CD and movie are lined up just right, Dorothy opens the door to the world of color just as the cash register opens in Money. It's pretty amazing. And interesting that Money is the song playing while we are introduced to a world made of gold. -Sometimes, it seems the munchkins dance to the rhythm of Money; though that may be stretching a bit. -In Us and Them, the lyrics say "black and blue, and who knows which is which, and who is who," as the camera switches from the Wicked Witch (black) to Dorothy (in a blue dress). Did they mean "which is which" or "witch is witch?" -In the same song, the lyrics say "up and down, but in the end it's only round and round," which is exactly what happened to Dorothy's house. -It's interesting that the title of next song, Any Colour You Like, references "color." Again, it's an instrumental that could have been given any title. -The next song is called Brain Damage - and we meet the "brainless" Scarecrow. -In Brain Damage, the lyrics say "the lunatic is on the grass," as the Scarecrow, who's made of straw (grass), dances around. -The song Eclipse ends with a thudding heartbeat, as Dorothy listens to the Tin Man's chest in search of a heartbeat. What do you think? Coincidence??? Silliness??? Neat? Stupid?